Donnie's got problems. His past is a mess, he's on several kinds of medication, he sleepwalks, and recently he's started seeing a terrifying six-foot-tall rabbit named Frank who tells him the world is going to end in a few days. The thing is, assuming Frank exists, he might be right. So begins writer-director Richard Kelly's twisted treatise on metaphysics, philosophy, time travel, and high school. It's about as strange as it sounds, but it gets enough of a fascinating vibe going that it's difficult to look away. The high school angle of the film is blown appropriately out of proportion, exaggerating all the stereotypes you'd find within, from the overbearing, self-important busy-bodies to the completely unappreciated English teacher. The mystery, however, is how any of this has to do with a sleepwalking kid and a giant apocalyptic bunny. Sorting that out is no small chore. You won't find any easy answers here. It's a film that rewards a confident leap of faith into it's eccentricities, and an understanding that some of it can't be understood. The payoff, however, outweighs the risks for those willing to take the plunge. For all its thick strangeness, there's something smart, subversive, and delightfully confusing going on. If you're up for it then by all means dig in. Note: There is a theatrical cut (released in 2001), and a director's cut (released in 2004) of the film. Both are equally good films, but significantly different. The theatrical cut offers a more even pace, a better soundtrack, and a more open-ended mystery. Meanwhile the director's cut has better character development, a much slower pace, and a more thorough examination at the science and critical thought behind the mystery. If you're planning to watch the film more than once start with the theatrical cut the move on to the director's, but if you're in it for the single serving then the director's cut might be more rewarding to you. That said, it's hard to go wrong with either. 8 out of 10 for both versions. Seeing a feeble, elderly man being blackmailed by a ruthless teenager is one thing. When the elderly chap turns out to be a former Nazi prison camp officer in hiding, it's quite another. It's difficult to choose sides in this game of intimidation, mostly because both sides are utterly despicable. But those with a strong tolerance for darkly intense drama will find that Bryan Singer's follow-up to The Usual Suspects is a twisting, disturbingly compelling masterstroke. Ian McKellen does some brilliant work here as a fugitive criminal, but this is really the late Brad Renfro's show as the manipulative youth. And watching the two square off in their battle of wits is heart-stopping in its intensity. Much of the rest of the film manages to keep up with a little help from a subtle but effective score and a sure-handed, even pace. There's really very little not to like here, but it's certainly not a film for everyone. It's probably safe to say that folks who are offended by using such an emotional subject as Nazis and the Holocaust for the purposes of fiction should probably stay clear. But anyone else looking for some powerful, jolting drama should certainly seek this gem out. Honestly, how could anyone not want to see a movie in which a still-living, geriatric Elvis teams up with a black JFK to fight a mummy haunting a retirement home? There's no reason you can possibly come up with to pass this film over. I mean yea, the pace is a bit off at points, slow enough to keep pace with its protagonists, and the film's sense of humor comes and goes with the tide, but for sheer B-movie novelty alone this kind of film is gold. Bruce Campbell plays his caricature of Elvis with enough foulmouthed gusto and wit to make it a beautiful tribute to The King, while Ossie Davis does himself proud in one of his final roles. It may not be anything more than a bit of cheesy, low budget comedy-thriller fun, but for concept, for execution, and for the sheer gall of it, this is absolutely worth the effort. Some lessons in life are tougher to learn than others. Some you're not even aware you are being taught. Garden State is about a man, medicated into oblivion since age ten, going off his meds for the first time in fifteen years while returning home to deal with death of his mother. The film speaks to a lot of things, about moving on from old friends, about alienation with one's parents and about how, ultimately, you can't go home. For a debut, writer-director and star Zach Braff damn near knocks it out of the park, telling his story with heart and humor and an always surprising sense of quirk. It still smacks of amateur filmmaking at points: the pacing can be erratic and Braff's hand seems unsteady handling the older actors. Also the very end reeks of a last-minute rewrite. But on the whole it's an exceptionally competent and, I expect, personal film. It may not be everyone's cup of tea but it's probably safe to say many will find it a fitting and appropriate way to cathartic melancholy. Proof positive that it takes more than amazing art direction, fantastic camera work, and a stellar concept to make a great movie. Set in the tone of quasi-sci-fi film noir, wherein an amnesiac seeks to remember who he is and why the whole world seems to stop at midnight, the story winds and weaves around mind bending ideas that speak of memory, of humanity, and of reality. It's all heady stuff, but writer/director Alex Proyas doesn't quite seem to know how to get his exceptionally talented to sell it, nor his editor to preach it. Things smooth out some after an exceptionally rough first act, but the film's quality never quite matches up to its bold underpinnings. The eye candy and plot are still enough to keep you engaged through to the end, but many moments of the movie seem to fall flat for no reason. It's good fodder for film students or folks looking for a fresh narrative, but in the end it's just too uneven to recommend wholeheartedly. On the one hand it's a whip-smart condemnation of the shallow mindset of late 80s yuppie culture. On the other, it features a banker who's only path to catharsis seems to be gruesome murder. The film is the crossroads between Wall Street and A Clockwork Orange, featuring a chillingly logical extension of Gordon Gecko's “Greed is good” mantra, amped up by too much caffeine and a homicidal inferiority complex. The result is an eerily fascinating ride with a man utterly devoid of humanity. It's not without its flaws: the early parts of the film are easily the strongest, illustrating the outrageously jealous nature of the anti-hero with a blazing, almost groundbreaking level of focus. The film falters, however, in a slower second act that seems to drag to an almost repetitive mosey in parts, and an utter failure to properly explain things at the very end. It's kind of a shame too. While the film is extremely watchable regardless, the flaws are a blinding blight on an otherwise mirror shined, razor sharp ax of a film. Also known as Neko no ongaeshi. Finding an intelligent, thoughtful, and entertaining children's film can be quite a chore. 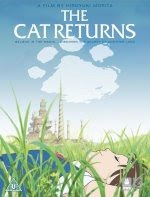 There's a sense of whimsy in The Cat Returns, a childish sort of unimportance that's hard not to smile at. Essentially it's a kind of less trippy take on Alice In Wonderland, featuring anthropomorphic cats. Along the way there are acts of rousing heroism, some fun bits of occasionally dark humor, and a moral about believing in yourself to tie it all together. In other words: perfect fodder for the younglings in the house. The adults may or may not get a kick out of too, depending on how in touch they are with their inner child; unlike most American kid's films, this one lacks that additional layer of humor targeted at the grown-ups. Regardless, the animation is crisp and fluid, with some wonderful nuance added to the leads, and the English-language voice track is superbly translated and expertly performed by a cast of knowns. This isn't an exceptional film by any stretch, it's merely a good one to sit the kids in front of and, if the mood strikes, perhaps pop in for the kid in you. It's simply a slice of innocent fun. The thing is, no matter what I say here this is still an anime classic. That much is absolutely indisputable. So when I say that it's starting to show its age, you can also interpret my meaning to say it's “maturing.” Back when it was first minted, this was to anime what 2001: A Space Odyssey was to sci-fi. They've even got similar plots, ultimately. Here we deal with a pair of punks from a biker gang who get wrapped up in a corrupt government's experiments to study superhumans, all within a future-Tokyo full-to-bursting with civil unrest. When it came out, the plot concept was quite new and fresh. That it's considered 'overused' these days ought to tell you something of this film's influence. The problem with the story though, is that it's taken from a long-running series of manga (Japanese graphic novels) and whittled down into two hours, so you wind up saturated with difficult concepts that don't have time to register, yet have severe consequences within the film. It's nearly incomprehensible unless you're in it for the long haul and watch the film several times. However, the rest of the film is rock solid stuff. The movie is an absolute miracle of cell animation—it is distinctive, colorful, detailed, gloriously fluid, and dazzlingly thorough in creating a gritty, violent future and the now-iconic characters that inhabit it. The action and pacing therein is also the stuff of legend. The opening fight between rival biker gangs remains one of the most recognizable moments in animation, and the grotesque, almost Lovecraft-ian finale is rife with unforgettable images. Akira's place in the pantheon of genre classics is deserved and, by now, solidified. But if you're a pair of fresh eyes coming to the party you'll have to understand that though there's still plenty to love here, the story's answers simply aren't available to first-timers. Some say that technology is guided by the plot devices of science fiction. If that's true, then Neuromancer would most be like a prominent book in the Bible. For a book published in 1984, the level of predictive concepts and their implementation are such that even today, almost 25 years removed from its master's pen, it still feels ahead of its time. But from a practical level, this is a tough book to read. It is so caught up in its slang and interpretive concepts of advanced computing and future society that the reader's mind has to dig pretty deep to find the plot buried under the ideas. In simplest terms, it's the story of a drug addict hacker being hired by a mysterious benefactor to snoop around some shady systems. The tale is told with enough depth and heft that it remains interesting, but this is really a book about the world the characters inhabit. So many of the ideas in this book have come to pass, so many will soon, and some are far enough out that there's no telling, but all seem plausible (or at least feel plausible). The level of influence this book has had on science and science fiction is nearly limitless, and if the story weren't so densely concealed behind giant conceptual tomes, this might be an easier book to recommend. If you're up to the challenge, go right ahead. It's a rewarding read for the worthy. For many though, this may be a book better appreciated than read. Those steeped in comic book lore will find a lot of familiar ground being tread here. For the fellow geeks in the house, all you really need to know is that Season 1 is basically X-Men's central conceit (with particular elements of the “Days of Future Past” and "God Loves, Man Kills" storylines) with the focus similar to Alan Moore's Watchmen. Across 23 episodes, the show is essentially the story of a significant segment of humanity suddenly gaining superpowers. Some fly, some are psychic, some can stop time, some can recover from any injury. Many use them for good, others for varying interpretations of evil. And then there are the requisite shadow conspiracies, mere mortal helpers and antagonists, and the crazy, sometimes too-perfect machinations of any good comic soap opera. There's a lot to like here, pulpy though it may be. The focus is kept pretty narrow in spite of its “save the world” plotline, but this lets the writers really let us get to know the ridiculously huge cast, as well as keeping the drama at a strictly human level. Toward the middle and end of the series, there are some genuinely breathtaking moments that stand out head and shoulders above most of what's on TV. The downside of the focus, however, is that there is rarely a point where the full gravity of what is going on is explored. There are none of X-Men's civil rights metaphors, or really any message to the story at all. Instead it's more of a Dickens-ian confluence of intertwining threads, some of which are utterly fascinating (the Cheerleader and Hiro narratives), some just okay (the Petrelli Family tale), and one in particular that just never clicks (the Single Mother story). Similarly, the early going in the series is rough—the story doesn't really begin until about the fourth episode. Despite its flaws, the series features a decent pile compelling characters, some clever plotting, and moments of great drama. Better TV shows have come and gone, sure, but Heroes manages to stand on its own. Uplifting, desperate, hopeful, and honest, The Road is a triumph of intimacy and loneliness at the end of the world. In following a father and sun as they pick their way through the desolate wasteland of a nuclear winter, Cormac McCarthy's stream-of-conscious writing style plays a philosopher's narrative on the death rattle of humanity. There's little that's typical about this sort of story. There are no grand, Mad Max-esque battles for resources or trips through the piss-stained hovels of depraved, starving refugees. Instead, it is a book entirely consumed in the father-son relationship, their nomadic journey through a dying wilderness, and the pair's absolute trust and dependency on each other; the post-society setting merely provides a narrative context for absolute desperation. The tale is quiet and thoughtful, slow and uneventful, methodical and dangerous. And like the best of genre fiction, it rings true.